Sir Jeremy Heywood, Cabinet Secretary and Head of the Civil Service, reviews Who Governs Britain? by Anthony King. In this short political primer, King analyses the power and influence of the main players in British politics today, including the Prime Minister, Ministers, civil servants and Special Advisers. As you might expect, I want to focus on King’s chapter about the Civil Service. If you’ve read his bestselling ‘Blunders of Government’ (co-authored with Ivor Crewe), you’ll know he is an engaging writer. And, although concise, this latest book achieves what it sets out to do, outlining “the view that one person - the present author - has of Britain’s political landscape as it appears from, so to speak, the window of a passenger aircraft cruising at 35,000 ft”. But, in doing so, it begs the question of just how accurate King’s personal take on Britain as a nation “in chronic economic difficulties and ...continuing decline as a world power” really is when, as he admits, “enormous amounts of detail, visible and highly significant down below on the ground, are lost”. Take, for example, a subject close to my own heart - King’s portrayal of the Civil Service as “increasingly no longer capable of providing ministers with the knowledge, the long experience and the ‘ballast’ that they require”. I would argue that the facts tell a very different story. In reaching his conclusion, I do not believe that King has really kept up to date with the major changes that have taken place over recent years to strengthen the modern Civil Service. Many of his sources appear out of date or at least highly selective. For example, there is no evidence that any of our recent apprentices, fast-streamers, frontline staff, policy experts or heads of professions and functions were asked for their opinions or insights. This absence of more diverse voices underscores, in my opinion, King’s rose-tinted view of what he identifies as the ‘classic’ form of British Government. For King, the highpoint of British statecraft was apparently between 1945 and 1970, when he suggests everyone’s roles and responsibilities were clear and the British way of doing things was globally admired. What King fails to mention is that this was actually a period in which Britain emerged almost bankrupt following the Second World War and continued the relative economic decline which had taken firm root since the turn of the century. We exited from empire in a disorderly fashion providing little administrative support in places such as India and Pakistan, which caused chaotic conditions and inflicted misery on many. In comparison, King believes today’s civil servants are less dynamic, short on corporate memory and suffer from a deficit of essential skills. As a result, they no longer have the influence and authority they once had to advise ministers or “speak truth unto power”. Particularly coming from such an experienced and respected commentator, this represents a very strong challenge. And obviously, in any organisation as large as the Civil Service, there are areas of poor performance. For example, I have readily acknowledged that we need to do more to increase our commercial capability - one of my top priorities for Civil Service reform over the next Parliament. But what King’s account fails to acknowledge is the progress that we have made in this area and for example in digital and project management skills in the last few years. we have helped to transform rehabilitation and begun to revolutionise the delivery of public services for the digital age through the ambitious work of the Government Digital Service. The Civil Service now operates in a more complex and demanding operating environment, often needing to create bespoke IT solutions that are untested. In areas where there have been issues - openly acknowledged by the newly created Major Projects Authority - such as changes to welfare, civil servants have taken a critical role in providing the sound advice that has helped address teething issues and get some of the largest welfare reforms this country has ever seen onto a more sound footing. Despite a number of years of pay restraint, the Civil Service also remains one of Britain’s most attractive employers – applications to the Fast Stream continue to be high and our retention rates compare favourably to the private sector. In the Civil Service, we recognise that the competition for talent is now global and that the world of work has been transformed since the 1970s – the classic period, the passing of which King laments. People no longer expect or want to confine their whole careers to one job, organisation or sector. To flourish in this more dynamic, less deferential era, we need to offer our people challenging work, flexibility and support. This includes helping them to develop their careers in professions such as communications, legal services and economics, or to gain broader experience and expertise through shadowing, secondment and loan opportunities with other teams, departments, public bodies or private sector organisations. A more fluid relationship between the public and private sectors can work to the advantage of the Civil Service, helping us to develop the skills of our people, bring valuable skills and experience in from outside and making it easier for us to work with our suppliers and get the best deals for public money. I am proud of what we have achieved in terms of efficiency improvements over the last Parliament – we have started to embrace digital as a means of public service reform. For example, HMRC have built the Business Tax Account – this is currently making tax easier for 1.8 million businesses, and we expect a total of 5 million businesses to have access by next April. The Department for Work and Pensions have also piloted a new form of Job Centre in London Bridge, then rolled this out nationally in six months with 6000 devices and wifi enabled offices. There claimants can job search, answer their own queries supported by Digital Advisers, if they get stuck. In addition, these Advisers can assist with simple benefit enquires, simple IT training, help customers upload CVs, and advise on using Twitter/LinkedIn/Facebook to find work in the 21st century. Despite what Anthony King writes, the Civil Service hasn’t always been the true meritocracy and driver of social mobility it should be. We have typically been dominated, certainly at senior levels, by Oxbridge-educated white males. That is simply no longer acceptable. My predecessors and I have done a huge amount of work to change this culture, realising that we must draw on all parts of modern British society - not only to ensure we reflect the people we serve, but because we cannot afford to miss out on the depth of talent outside the relatively shallow pool that fed the ‘classic’ era. Our fast stream is now one of the most diverse graduate entry schemes in the country. We have also introduced our successful and expanding Civil Service Apprenticeship Schemes. And, as an employer of choice, we’re leading the way with modern employment practices such as shared parental leave and flexible working. I recognise the need to do more on diversity, but the Civil Service does better represent now the nation it serves. There were hardly any female and virtually no ethnic minority Permanent Secretaries in the era that King harks back to, there are now 8, and across the Senior Civil Service as a whole 38.6% are women and 4.1% are ethnic minorities. While we continue to modernise the Civil Service, it is important that we retain our traditional strengths. Here, too, Anthony King provides a challenging perspective, arguing that our influence with ministers has been fatally weakened, and that Ministers more readily turn now to Special Advisers, political think tanks and other opinion formers. If anything, I’d argue that the information explosion of recent years – with more political analysis and research available than ever before – has empowered, not threatened, civil servants. The greater availability and accessibility of data has stimulated an enquiring, evidence-based and practical approach that has reinvigorated policy-making in government, focusing on what people really do and think. We need look no further than the Behavioural Insights Team - a real British success story - for proof of this. However, we recognise that we do not have a monopoly on good ideas, and, in recent years, we have become far better at collaborating with our partners and consumers at the local, regional and national level – including frontline staff and the public – to design and deliver more high-quality, cost-effective services. This is helping us to break down the silos that have led to mistakes in the past, and also break out of the so-called ‘Westminster bubble’. This does not reflect a weakening of the role or prestige of the Civil Service. Far from it – our willingness to embrace a new culture of openness is a sign of confidence and reflects my conviction that by opening ourselves up to greater challenge we sharpen and broaden our own performance, enabling us to provide better advice for ministers and to speak truth unto power with even greater authority. At the click of a button, we’re able to access the latest research from around the world. We can also gain an even greater understanding of the global, political environment in which we work – commissioning external research for Ministers, delivering our own high-quality analysis and consulting more closely with colleagues and outside experts, partners and consumers to provide the best advice. This enthusiasm of officials to challenge assumptions, experiment with new ideas, broaden the range of views they seek and use the latest analytical techniques is something to be admired, not criticised. It eliminates group-think, strengthens collective responsibility and give us a strong body of evidence on which to base advice and, if necessary, say no to ministers - and we do say no when it’s the right thing to do and will lead to the best outcome for the citizens of the UK. King’s own recognition that the Civil Service is more open than it used to be highlights this very point. The regular appearances of senior officials before select committees, the FOI Act and, I add, the huge surge in the use of information online and social media does mean that there is nowhere to hide. Our decisions, mistakes and achievements are exposed and emphasised within minutes, to millions - a level of scrutiny and accountability that has surprised, impressed and even daunted private sector executives on our leadership exchange programmes. This in itself ensures that we speak truth unto power. We expect every Civil Service leader to be straightforward, truthful and candid in their communications to those they serve and lead. If King had talked to more current civil servants in the course of his research, he would know this. 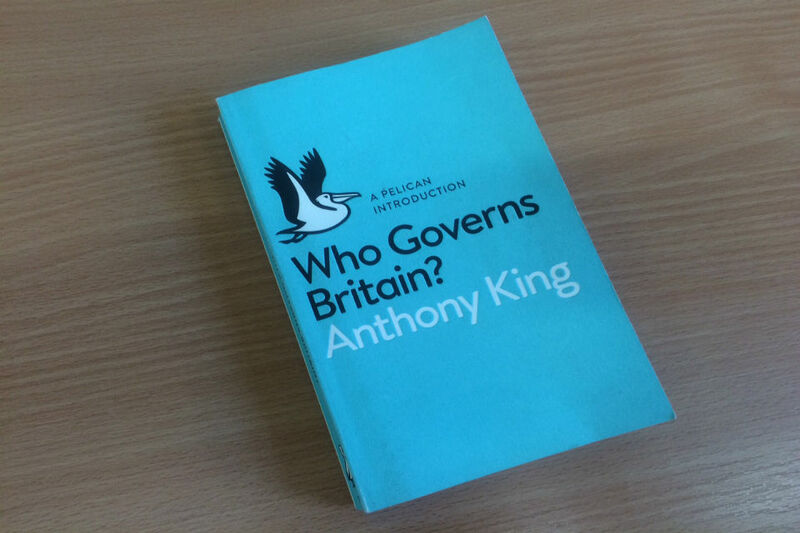 So while King’s book succeeds in giving one high-level, individual view - his own - of Britain’s political institutions and leaders, it does not reflect the current situation and direction for civil servants. In modern Britain, with all its innovations, opportunities and challenges, the details matter. We have worked, and will continue to work, on these details in order to improve the future for Britain. It is this point that King has missed, his snapshot opinion does no justice to the progress that has been made by government and the Civil Service and the strong position it stands in to continue to work for Britain. 'We exited from empire in a disorderly fashion providing little administrative support in places such as India and Pakistan, which caused chaotic conditions and inflicted misery on many.'.... Really?? In disorderly fashion?? Not from what I remember.... In fact, our decolonisation processes were generally regarded as superior to those of other European powers, and a lot of African countries were left with healthy bank balances when the British left. I fear that your bias is clearly in the other direction. Unfortunately, you don't seem to coherently address what Mr King outlines in his book but rather reel off some statistics/examples of what the Civil Service has undertaken in recent years.... But that's not what he is really getting at is it? You have created your own 'straw man' argument and sought to counter it. The withdrawal from the subcontinent (1947/48) was chaotic and miserable for many because of the communal violence between Hindus/Muslims/Sikhs when it was partitioned between present day India (intended as Hindu homeland) and the Pakistans (for Muslims, one of which became Bangladesh). There were attacks on and between refugee columns of the three and harrowingly many Sikhs killed their daughters to avoid their being raped by men of the other side(s). The tight timing of the withdrawal of British troops was blamed on their happening and Mountbatten (our last viceroy) heavily criticised over these. "a period in which Britain emerged almost bankrupt following the Second World War and continued the relative economic decline which had taken firm root since the turn of the century"
Or, put another way, a period in which Britain emerged almost bankrupt following the Second World War and heroically paid down that debt through a global export drive while enduring austerity at home, from which the country emerged in the 1960s to re-assert cultural and diplomatic influence out of all proportion to its population or the size of its economy. The overall impression I gained from this review was one of defensiveness, an unfortunate aspect of Civil Service culture and one that we need to leave behind. Feedback is a gift, to be accepted and reflected upon. Dismissing that feedback because it is one person's view is unhelpful (I won't be trying that in my upcoming mid-year review). Yes, Professor King has written this book from his individual perspective. That cannot be surprising, nor does it invalidate the conclusions. I'm surprised by the lack of impartiality in this review. Does Sir Jeremy really believe that: "the British economy and our banking system have been rebuilt, the fiscal deficit has been brought under control, and major savings have been found in public expenditure, without damaging the quality and responsiveness of public services". It just doesn't ring true in the real world, where many people feel more insecure at work, where the banking system seems to be reverting to its pre-crash ways of operating and NHS waiting times have been increasing, and access to mental health and social care services has been cut. Sir Jeremy you say that you “fundamentally disagree with King’s claim that civil servants have lost their ability to influence ministers and speak truth unto power”, and that you “do not think he provides any convincing evidence to substantiate this controversial suggestion”. You quote the last five years “where civil servants have played a huge role in helping to design and implement some of the biggest reforms in a generation”. As a working civil servant I believe Professor King is absolutely correct in his assertions, but with some qualification. I don’t believe King’s intention is to ‘sleight’ civil servants as individuals lacking but highlight a system which is lacking, which in its attempt to ‘get modern’ is failing in other ways. Following on from your response (to King’s assertion) based on ‘evidence from the past five years’; the reality of the situation has seen a coercive, ‘threat-management’ based approach/response (PMR) imposed on civil servants from ministers and the government. We have been forced to follow a direct line or approach (rejected in some areas of industry) where our influence and ability to speak truths has gone ignored. The fact that PMR was arbitrarily imposed on the civil service, gives in my view, one clear, important example of the loss of ability to influence. You also mention the role of the civil service in the reforms, but do you honestly believe that civil servants would have signed up to the less efficient system of shared services we have now and to the complete incompetence and inefficiency of a ‘reformed’ civil service pensions system? These are just further examples of the lack of ability to influence. All this has seriously affected morale, undermined the value of the good work civil servants have already done and effectively constrained what civil servants do now. I believe that what Professor King is actually seeing is the ‘fallout’ from all of this. We are becoming less dynamic and individual skills are decreasing more because individuals are now expected to do many or more different tasks, quickly and with the minimum of very basic training, thereby lacking full specialisation in any one of these tasks. We are becoming ‘jacks of all trades’ but ‘masters of none’! Also the civil service ever remains a ‘risk averse’ organisation so the level of ‘dynamism’ and influence allowable will always be at a diminished level. Civil servants have always been resilient and dynamic (you and your predecessors keep telling us so!) but constrained by archaic rules and thinking (e.g. PMR) and decision-making. Any initiative or innovative thinking falls upon stony ground unless it fits within some ‘government model’, which effectively means we are constrained to thinking always within ‘a box’, but never thinking ‘outside the box’! So I feel King is correct in his assertion to a considerable degree (if not entirely).